Missouri is known as the Show Me-State and with good reason. With plenty of natural resources, casinos, and entertainment, Missouri has a lot to show visitors from across North America. 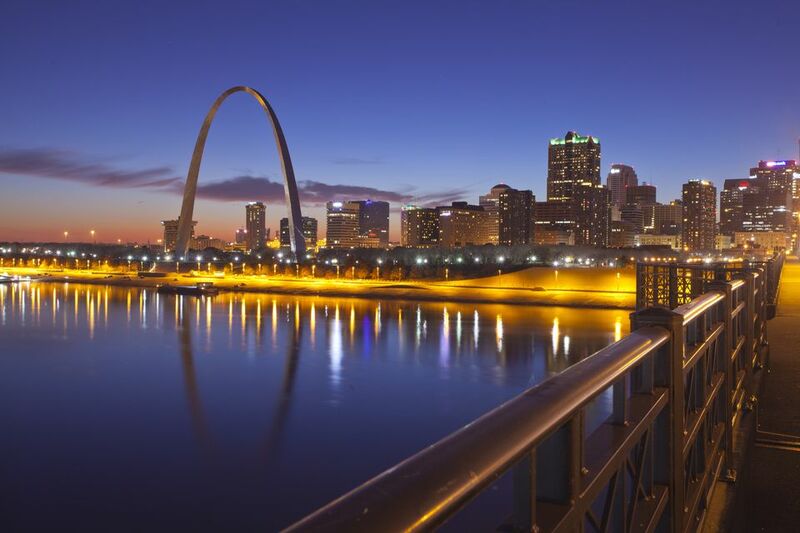 Missouri offers the opportunity for RVers to get away from it all, enjoying city life, farm life, and some of the most beautiful sights you’ll see during your travels, including The Gateway Arch in the heart of St. Louis. That’s why we’ve put together our top five RV parks and campgrounds for Missouri, so you can explore what the state has to show you. Basswood RV Resort is a perfect place to make camp before experiencing the fun of Kansas City. You won’t have to worry about dry camping as Basswood is loaded with amenities. Basswood Resorts gives you a choice in choosing your site, they offer pull-through sites and larger sites with patios and picnic tables, but all sites come with 30/50-amp electric hookups, water, sewer, cable TV and Wi-Fi access. The showers and laundry facilities have also received 10s from Trailer Life Magazine. Other facilities include a camp store, pizza parlor, propane refill and walking trails. Basswood provides some in park fun like fishing, a swimming pool, large splash park, game room, walking trails and typical park fun like volleyball and horseshoes. The park also hosts events and activities for some great family fun. There are many area attractions as well like Worlds of Fun Amusement Park, Harley Davidson Factory, Kansas Speedway and the park is less than half an hour from the fun and delicious barbeque of Kansas City. A campground must be confident to call itself America’s Best and this campground doesn’t disappoint. America’s Best Campground can accommodate the biggest of rigs in their spacious pull-through sites. Sites offer full utility hookups, free satellite TV, and free Wi-Fi access. The bathhouses and laundry facilities are clean and spacious, earning a 9.5/10 from Good Sam RV Club. Other facilities and amenities include grills and concrete patios at each site, a convenience store, RV/car wash and colossal meeting pavilion so you can bring the whole extended family. Fun at the grounds includes a pool, spa and RV park standbys like horseshoes, basketball, playgrounds and a game room. Looking for fun outside of the park? You’re in Branson! The showiest city of the Show-Me State. America’s Best offers concierge service and ticket sales, so you can decide what casinos you want to visit, what fine establishments you want to dine at, and what kind of entertainment you and your spouse or the whole family can enjoy. Goodness gracious, Mark Twain Landing is always having fun, and you bet you’re invited. This park is loaded with all your favorite amenities and facilities. The large pads include full utility hookups with both 30 and 50-amp electric connections. Sites also include cable TV, Wi-Fi access, fire rings, and grills. Other park facilities include bathhouses, laundry facilities, fitness center, rec hall and convenience store to name a few. Mark Twain is also loaded down with fun. There are playgrounds, swimming pools, indoor and outdoor movie theater, mini golf, access to a private lake with a fishing pier and the gem of Mark Twain Landing, Splash Landing. You’ll find yourself surprised you’re in an RV park and not an established water park as Splash Landing has a lazy river, splash pools, water slides and a massive tide pool. The southern US states have an extensive cave system, and Onondaga is one of the gems. Onondaga Cave State Park has all the features and amenities an RVers needs to have a relaxing time. There are plenty of standard RV sites outfitted with electrical and water hookups. Hot showers and laundry facilities are available at the park during the peak season of April through October. Onondaga rounds out its facilities with a dump station, playground and amphitheater which hosts nature programs during peak season. The best way to spend our time at Onondaga Cave is in the cave itself. Onondaga Cave is a natural wonder containing stunning stalagmites, stalactites, and other active cave formations; you can even take guided tours to see everything the cave has to offer. There are activities above ground as well. You can hike up to the Villander Bluff Natural Area which looks over the Meramac River. The Meramac offers excellent fishing as well. Jet down to Lake of the Ozarks to enjoy Missouri’s largest state park. Lake of the Ozarks State Park provides many RV sites equipped with both water and electrical hookups to take care of your creature comforts. You can even book several family sites if you’re traveling with partners or a large family. Other amenities and facilities at Lake of the Ozarks include bathhouses, dump stations, laundry facilities and a ranger station for questions about the area. At over 17,000 acres, Lake of the Ozarks offers plenty to explore. You can start below ground by exploring Ozark Caverns. For those who want their feet on solid land, there are miles to hike in the park’s twelve unique trails. The life of the party is found at the lake the park is so named for. There are 85 miles of shoreline where the kids can play, or you can go out on the lake itself for canoeing, boating, skiing, wakeboarding, fishing or cruise and look at the great sights the area provides. While Missouri, and St. Louis itself, is often a state people drive through on the road to some other adventure, consider the Show Me-State the next time you’re looking to travel away from home.